Ocala, Florida — According to the Ocala Police Department, 16 vehicles were burglarized on May 14, 2014, all within two (2) hours — between 5:45 p.m. and 7:34 p.m.
Over the past several months, Marion County has experienced an increase in car burglaries. 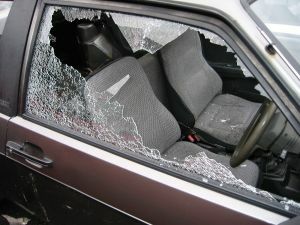 Oftentimes, officials place the blame on victims for leaving a window open or car door unlocked, since it creates a crime of opportunity. However, that was not the case yesterday. OPD said if the doors were locked, the thieves smashed the windows and stole purses, wallets, cash, and electronic devices. The burglaries happened at Jervey Gantt Park, the YMCA, and Ward-Highlands Elementary School. The damages are estimated in the thousands of dollars. Park goers should be alert at all times. Statistics show that criminals are dumb enough to return to a crime scene to strike again. Anyone with information about the break-ins can call OPD at 369-7000 or Crime Stoppers at 368-STOP, text a tip to 274637 using keyword 368-STOP, or visit www.ocalacrimestoppers.com.